The reputation of Conrad Weiser as a statesman is secure for all time. A biography of Weiser, subtitled Pennsylvania Peacemaker, was distributed among representatives of the United Nations some years ago in an endeavor to secure that organization’s secretariat for Philadelphia. For Philadelphia was center of William Penn’s “Holy Experiment” in establishing tolerance and brotherhood among all national, racial, and religious groups in the New World. More than two hundred years ago, the courage, the industry, and the understanding of Conrad Weiser helped to nurture this small nucleus of hope for a world that eventually will unite for peace. Yet if this world pioneer had never negotiated a single Indian treaty, he still would have been noted by the local historians of his Heimat; for Conrad Weiser was the leading citizen of the community in which he lived. Weiser was not the first settler at Tulpehocken, for he arrived near what is now Womelsdorf, Berks County, in 1729, six years after the first Palatine immigrants from Schoharie. Nor was he patron of the community such as the Reed family then was. Weiser grew gradually in stature-like an oak-among his fellow pioneers. For them, it was his success as farmer and businessman, his wisdom as justice, his logic in a baffling conflict of churches that distinguished him above his compatriots. In both his lives-as statesman and as citizen of his neighborhood-it was a special grace of spirit he possessed. His blending of good will and good judgment rendered him attractive as a man and a leader of men. Learning the Indian Way of Life Conrad’s earliest years in Pennsylvania were occupied with the necessary task of creating a home and farm on his property at Tulpehocken. But within a few years of his arrival (1729) in Pennsylvania, his knowledge of Indian ways brought him into the service of the colony as an interpreter. His rewards for these services provided a rich supplement to the income from his farm. With the consent of his father, Conrad, aged seventeen, left his Schenectady home to live with the Maqua (Iroquois) Indians for a period of eight months . . . During these formative months of his life young Conrad lived the life of an Indian, absorbed much of their culture, learned their language, and suffered the privations to which these improvident people were subjected, especially during the winter months. Weiser’s Indian PolicyShortly after Conrad Weiser appeared in Pennsylvania in 1729, a new Indian policy began to take shape. Jointly the work of Weiser, Indian Chief Shikellimy, and James Logan, then Provincial Secretary for Pennsylvania, the policy depended for its implementation largely on Weiser’s acumen in Indian politics-a skill he had acquired in youth when he learned to know and to respect, even to love, the Indian way of life. Briefly expressed, Weiser’s Indian Policy attempted to strengthen the control of the confederacy of Indian tribes then known as the Six Nations. This was the most powerful union of Indian tribes in the East, and thus became the predominating factor in the colonies’ relations with all Indians in America. Around this constant in Indian politics, a policy took shape: to strengthen the Six Nations confederacy by recognizing its Council’s sovereignty over all Indians in Pennsylvania-including the trouble-some Delawares, “nephews” to the Six Nations. The Delawares, smarting under the humiliating epithet “women,” dealt them by the Six Nations, were discontented because of the loss of their lands, which had been sold to the Penns. Through friendly alliance with the Six Nations, the Delawares would be restrained, a war between Indians and settlers be averted, and the friendship of the Six Nations be held fast-all in one package! This was the policy which emerged shortly after Weiser’s arrival in Pennsylvania and which he strove to maintain until his retirement in 1758. Weiser outlived the other two collaborators, Shikellimy and Logan, and survived to see the success of his policy demonstrated. In the year 1758 a peace conference was called at Easton to settle the war between the Delawares and the colony. The Six Nations had representatives present who were infuriated at their “nephews,” the Delawares, for having claimed the right to make an independent treaty. When the conference threatened dissolution, control was placed in Weiser’s hands. He gave assurance to the Six Nations that Pennsylvania would continue to support their sovereignty. The treaty, as finally made, was between Pennsylvania and the Six Nations Confederacy. This long-standing friendship between the Colony of Pennsylvania and the Indians stood the English in good stead during the French and Indian War, and proved a decisive factor in that conflict. For, some weeks later, when General Forbes finally reached Fort Duquesne, he found that the French had blown it up and withdrawn. He took possession and renamed it Fort Pitt. The Indian support of the French had vanished. The Six Nations’ friendship with the British had attended to that; and Conrad Weiser’s service in recognizing the value of that friendship and in making practical maneuvers to preserve it was demonstrated. The long range consequences are obvious. The success of the English in the French and Indian conflict helped to determine the pattern of the founding years of the American republic. And from that point the story is the history of our nation. The Indians recognized that genius which attached to the person of Conrad Weiser even more clearly than his white neighbors did. Ingenuously, they named him Tarachawagon, meaning “he who is holding up the heavens.” Indeed, Conrad had kept the sky from falling on the Indians, on his Berks County neighbors, and on Pennsylvania! Weiser in PeaceIn the brief scope of this article, we must pass quickly over Weiser’s earlier services, while he succeeded in holding the peace by negotiation. There was the Tulpehocken Treaty of 1736, “which gave to the Quaker Proprietors in Philadelphia claims to lands which trebled the deeded area of the province” … In the mid-winter journey to Onondaga (1737) Conrad Weiser with a single companion crossed the Appalachians through waist-deep snow in the mountains and torrential floods in the valleys, passed villages of starving Indians, who would kill a visitor for a slice of bread, to reach Onondaga. There he succeeded in restraining the Iroquois from attacking the Indians of Virginia in a war that might have involved the colonies of Virginia and Pennsylvania . . . In the Lancaster Treaty of 1744, Pennsylvania had little to gain, but Weiser negotiated it so that Maryland and Virginia gained the support of the Six Nations of New York in resisting the incursions of the French. The complexity of the problems that faced Conrad Weiser is equaled only by the complications of world politics today. Two leading European powers were struggling for supremacy in North America. France had occupied the land north of the St. Lawrence and strove to cut off the development of the British colonies west of the Appalachians by occupying the Ohio Valley, thus limiting the English colonies to the Atlantic seaboard. England had established 13 colonies along the Atlantic seaboard, but each of the thirteen was individual in its policy. Only Pennsylvania faced the true situation and endeavored to purchase these lands from the original owners, the Indians, and thus win their friendship, trust, and cooperation. Within this nation of whites, there existed another vaster nation composed of many tribes of Indians, far exceeding the population of whites. Among these ever-warring aborigines, one group had risen to supremacy-the Six Nations of New York. Their organization indicated political wisdom. Though, like the nations of Europe of that day, they still believed in the right of conquest, these Indian tribes were willing to make treaties and to abide by them. In this “impossible” situation of a nation within a nation, Conrad Weiser picked the winners. They were the Six Nations of New York and the Quakers of Pennsylvania: the Indians who would sign a treaty and stand by it; and the Quakers who recognized that though King George of England had granted proprietary right to this land, they must still purchase it from the original owners, the Indians. But Weiser, at this crossroads of civilization, faced a still further problem. The Indians still believed in the old way of securing land by war and conquest. The Quakers-who took social justice seriously-were opposed to war, war for any purpose. Believing that equity and justice should prevail, they refused to defend Weiser’s frontier from Indian invasion. Thus Weiser stood at the crossroads of the Old and the New World, of barbarism and social justice. Weiser In WarAs the pressure of the French from the north increased, Weiser’s frequent journeys to Onondaga, “capital” of the Confederacy of the Six Nations, became vital in the preservation of the friendship of these Indians for the cause of Pennsylvania. When Weiser’s leadership in this direction was superseded in New York by William Johnson, her agent, Conrad continued to serve Pennsylvania, as the colony embarked on a bold policy in the Ohio country- trying to open up that area for settlement. In 1748 he negotiated a treaty with the Indians of the area at Logstown (near present Pittsburgh). The train of reaction that followed is common knowledge; Bienville de Celeron’s journey next year through the same region, claiming these territories for France; the French military expedition as far south as LeBoeuf and Venango (Franklin) in 1753; George Washington’s winter journey, 1753-54, over the Venango path to LeBoeuf, with a summons to the French to leave the country; the disaster at Fort Necessity; the building of Fort Duquesne; Braddock’s defeat; and the French and Indian War. Thus was unleashed the holocaust which Weiser-and his associates among Pennsylvania’s colonial government-had striven to prevent. The battle for empire presently struck close to home for the Weisers and their neighbors living near the frontier (the “Kittatinny” or Blue Mountains) in Pennsylvania. In October some of Mrs. Weiser’s kinsmen came close to losing their scalps in the Penn’s Creek Massacre, and Conrad dispatched some of his boys to bring the family to comparative safety at Tulpehocken. Indian murderers stole through the woods taking scalps; panic spread in their wake; by late evening of Sunday, October 26, 1755, word reached Weiser that a force of French and Indians was east of the Susquehanna. Conrad sprang into action which belied his nearly sixty years; overnight he spread word for the men of Heidelberg Township to gather at his home at daybreak, those of Tulpehocken Township to the west to meet at Benjamin Spycker’s, and the two to join there presently. There Conrad was designated as popular choice for commander; his soldiers were armed with “guns, swords, pitchforks, axes, or whatsoever might be of use against the enemy and for three days provision in their knapsacks” -as he later wrote the Governor. Conrad divided the men into units, and “sent privately for Mr. Kurtz, the Lutheran minister who lived about a mile off, who came and gave an Exhortation to the men and made a Prayer suitable to the time.” The new army marched toward the Susquehanna (to the scene of the latest atrocity at Hunter’s Mills, known as Fort Hunter today), after fifty men had been stationed at the gap in the mountains through which the Shamokin Trail (from present Sunbury) came. As the army marched, it learned that the rumor itself was false, decided that its purpose was to protect its own land, and returned home. Weiser, convinced of the reality of danger, reported everything faithfully to the Governor and received in recompense a commission as colonel-a colonel without a regiment. Thus he embarked upon yet one more endeavor in his homeland; he became the commander of the local militia. Attempting to create some order out of the chaotic frenzy into which his neighbors had fallen and anxious not to upset the entire system of Indian alliances, Conrad journeyed to Philadelphia with a Six Nations Chief, Scaroyady, who demanded of the Governor and Assembly that they defend Pennsylvania and the alliance with the Six Nations. Though the Assembly did not satisfy the Chief, Conrad saved his loyalty and sent him to Onondaga to try to save the alliance. While Conrad was in Philadelphia, word reached him of the first Indian ravages south of the Blue Mountains. He returned home at once, only to find his neighbors were in arms-not only against the Indians, but also against the Colonial Government and all of its representatives, including Weiser! Only the appearance of smoke on the horizon-suggesting an Indian attack-saved Weiser’s life on this occasion. Conrad sent word to Philadelphia explaining the need for munitions. This and other information received there, as well as a literal stampede of frontier Germans against the Assembly, forced the legislature-still pacifistic under Quaker control-into passing a militia law. Now Conrad, who had received a commission but no soldiers, could proceed to create a real defense force. In May, 1756, he was advanced to the rank of Lieutenant Colonel of the First Battalion of the Pennsylvania Regiment, having 500 enlisted men and officers under him. In the first months of 1756 the Colony’s military plans took visible shape. The Governor made a tour of the province, including a conference with Indians at Carlisle. Conrad was kept busy with his efforts to preserve the friendship of the Indians. By early spring the Indian excitement had calmed measurably and the settlers could return to their homes. The war which had been declared against the Delawares in April-as part of maneuvers to retain the friendship of the Six Nations-reached a truce in June. But the colony did not relax its preparation. A chain of forts was constructed in these months near the gaps in the Blue Mountains to protect the settlers south of them. Conrad Weiser and Benjamin Franklin divided the responsibility for these forts- which were stockades around several blockhouses with a small garrison stationed in each. Weiser’s share of the work stretched from Hunter’s Mills on the Susquehanna River (Fort Hunter) eastward to Allemaengel (Albany Township, Berks County) From the river the forts were Fort Hunter, Fort Manada, Fort Swatara, Fort Henry (near Bethel). Fort Northkill (near Strausstown), and Fort Lebanon (near Port Clinton) . In addition, a few new blockhouses were erected between these. Since Weiser was responsible for the supplying of these forts, Fort Henry-nearest his home-bcame the center of distribution and command. Weiser also faced mutiny and unrest in these outposts as a part of his duties of command. He faithfully executed these duties until his resignation from the service in 1758-only two years before his death. Thus Conrad Weiser had the gratification of seeing his policy of honest and honorable dealing with the Indians vindicated during his lifetime, though he probably never recognized how much he had done to lead America to the concept of one united world at peace. The Farmer and the MagistrateNow that we have followed Weiser to the climax of his career as inter-colonial diplomat, we must retrace our steps to the beginning, 1729, and study this many-gifted man to learn how his ideas and ideals originated in his associations with his Pennsylvania German neighbors in Berks. Conrad’s early years in Tulpehocken were occupied with clearing and building the farm he had purchased near present-day Womelsdorf and supporting Anne Eve and the four children they had brought with them from Schoharie. But slowly he increased his property holdings until he became one of the largest landholders in the Tulpehocken Valley. In due time he established a tannery on his property, recognizing the need for processed leather in a growing settlement. Distinguished by his prosperity and by his consistent support of the policies of the colonial government, Weiser was appointed in April, 1741, Justice of the Peace in Tulpehocken Township of Lancaster County. (This was before Berks County had been established). He was honored with this office, too, because of his anticipated abilities to win the support of the Pennsylvania Germans for the policies of the Governor, George Thomas, which were opposed by the Pennsylvania legislature, then dominated by the pacifistic Quakers. Weiser contributed to this cause by issuing a handbill during the campaign of 1741, a few months after his appointment, in which he attempted to use the legislative support for the Governors program as the basis of the campaign. Quoting Biblical authority concerning a divided house’s inevitable fall, Conrad advocated a legislature which would vigorously support defense measures for the colony. The campaign was a notable failure for Weiser and the Governor’s party. The Germans, perhaps out of fear that they would be subjected to higher taxes, joined the Quakers in electing an assembly which dragged its feet in providing reinforcements for the colony’s frontiers. As justice of the peace, Weiser’s duties were various, but they contributed to his widespread acquaintance among the Pennsylvania Germans. Justice Weiser harbored stray cattle in his barn until the owner could come to reclaim them. He placed advertisements describing the cattle in the public press, so that owners would know who had them. The advertisements described the brands on horses’ hoofs and hips, and the incisions in the ears of cows. Colors were given in terms that are still familiar in the Pennsylvania German dialect of today, such as “schimmel,” “schekkich,” “hell bran,” etc. On occasion he even moderated in domestic embroilments between husband and wife. He helped to solve, as we shall see, the famed Tulpehocken Confusion. The justice also collected bad debts, for Conrad knew the value of money. The record in one case reveals the assiduity with which he approached his task. Such responsibilities, faithfully executed, earned him a good reputation among his countrymen, as they also strengthened his influence among colonial authorities. Zinzendorf and his co-workers were responsible for a number of itinerant ministers who attempterd to stimulate sentiment for this venture within existing congregations. More often than not they succeeded only in dividing the existing churches and in creating discord rather than the Peace of God. The little congregation on a hillside several miles west of Conrad Weiser’s home became the scene of this classic conflict between the Moravians and orthodox Lutherans. Weiser’s sympathies at first were directed against the orthodox Lutherans under the leadership of John Caspar Stoever, rather than in active support of the opposing party. When violence broke out, Conrad stayed home in disgust. Within a few months Weiser entered the Cloisters at Ephrata, as his biographers agree, in horror over the abuses of the church feud. Deeper than this, within the soul of Conrad, there was a religious struggle going on. The fight between the churches continued for several years; nor did Conrad’s internal religious struggle find peace at once. In time he left the Cloisters and allied himself with the Moravians. On the very day, November 25, 1742, that a Moravian Church was dedicated in Philadelphia, a young Lutheran clergyman arrived in Philadelphia who was destined to alter the entire church situation. He was Henry Melchior Muhlenberg, later to become the son-in-law of Weiser and eventually to become the leader of all Colonial Lutherans. After Muhlenberg’s marriage to Conrad Weiser’s daughter, Anna Maria Weiser, on April 22, 1745, Weiser’s ties to Lutheranism strengthened and his affiliation with the Moravians weakened. The Lutheran claim was based on the original existence of a Lutheran congregation on this site. Kurtz relied on Weiser for assistance. When the Moravians refused to surrender the key to the church, Conrad himself entered the fight and wrote to the Moravians’ officials at Bethlehem, accusing them of having defrauded the Lutherans. This action brought no less a person than the Moravian Bishop, Cammerhof, to Tulpehocken to settle the matter. Their discussion was lively but produced no results, save that Conrad became more convinced than ever that the Moravians were devious and ambiguous in their approach. The outcome of the conversations between the bishop and the magistrate was that Weiser now advised the Lutherans to ask again for the key. When that request was refused, Conrad simply ruled that the church property belonged to the Lutherans. Accordingly, they broke into the church, put a new lock on it, and claimed it for their services. This incident increased the community’s respect for Conrad Weiser. His own account of the melee appeared in Christopher Saner’s Pcnnsylvanische Berichtc, where it could be read throughout the colony. 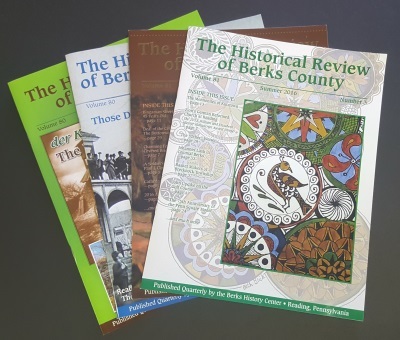 Founding ReadingOn another level of civic life, Conrad Weiser played a key role in the establishment of the borough of Reading and three years later (1752) of Berks County. These important activities too would have entitled him to local recognition as an outstanding citizen. Reading, or some future city, was inevitable at the confluence of the Tulpehocken Creek and the Schuylkill River, for the population of this area had increased greatly. In 1748 the surveyor of the Penn family, William Parsons, drew the plans for the future city, but lots were not opened to sale until June 15, 1749. And when they were, one of the three commissioners responsible for the transactions was Conrad Weiser. (A model of Penn Square in the Colonial period is on permanent exhibit at the Historical Society of Berks County). His activities in the foundling of Reading revealed his honest character clearly. When one of the commissioners began to attempt to profit personally from the sales, and fell tinder the wrath of the Penn family as a consequence, the task of mediating the ensuing quarrel fell to Conrad. When the terms of sale were imposed, namely, that a brick or stone building had to be erected on each lot within a certain time from purchase, it was Conrad who enforced the stipulation-and none too gently, if we may trust a sentence in a contemporary letter. The Rev. Richard Peters, Provincial Secretary, wrote to Thomas Penn in March, 1752 “It was very lucky that I gave the management of that town to Conrad. whose imperiousness has been of great service, for they build regularly, and if they don’t, or are any way abusive, Conrad deals about his blows without any ceremony and down drops the man that dares resist his ponderous arm-but withal I must say that it is judged by good sense and a necessary fortitude.” That the man “dropped down” may have been literally the case ! Conrad himself wrote on one occasion that he had given a settler the return on his survey “and ordered him to go and get a patent or be kicked.” He addled, honestly, “I was then quite out of humor.” Conrad’s rough handling of the citizens of Reading evoked the displeasure of Thomas Penn, who informed Peters in the summer of 1752 that he did “not much approve of Conrad Weiser’s methods of enforcing his orders.” But Penn readily admitted their effectiveness-and this was not to his displeasure. Conrad acquired land for himself on the central square in the new town among several pieces of property which he had purchased there. On Penn Square he established a general merchandise store, the first in the community. The site remained in the family’s hands until 1769, but the location has continued to serve mercantile interests until the present. Stichter’s Hardware Store is the contemporary successor to Conrad’s business enterprise. Several of his children received deeds to lots in Reading, and one of them, Peter, was set up in the saddlers craft on land in the city. Conrad himself moved to Reading in 1758, erecting a home there and turning the management of his farm over to his sons Philip and Frederick. It was only by chance that his death, two years later, took place at the farm. Weiser also helped to sire the formation of the first Lutheran congregation in Reading, Trinity Lutheran Church. By then the wavering attitude toward religion he had demonstrated earlier had disappeared, so as a faithful Lutheran he aided Pastors Muhlenberg, Brunnholz, and Kurtz in obtaining two lots for the erection of a church. When Trinity Lutheran Church was dedicated, June 17, 1753, Conrad prepared a lengthy German hymn of dedication, consisting of thirteen stanzas to be sung on this occasion. Community SpiritWeiser’s attitude, though faithful to his own church, revealed a willingness to support others in building up their denominations. With Isaac Levan Conrad took patent to two lots in Reading, opposite the Lutheran property, in 1754. Five years later, the two men deeded the land to the “Trustees and Elders for the Religious Society of Dutch Reformed Calvinists in Reading.” The conveying deed specified that the land had been purchased in trust for the purpose of erecting a meeting house for the congregation. Conrad also served on Reading’s school board and in this capacity aided in planning a lottery for the benefit of the schools and the Lutheran congregation. When that failed, Weiser arranged to transfer the property (which had been held in his name) to the charity schools, of which he was one of the trustees for the colony. The Family ManIn the years which followed the immediate threat of Indian attack on Reading and the Tulpehocken settlement, the struggle known as the French and Indian War moved out of the valley. Conrad Weiser’s services to his community may be said to have been completed when his versatile genius as local church man, magistrate, citizen, and soldier has been set forth. And yet there is more to be said. Conrad Weiser sired an extensive family-and they were a contribution to his community. His sons Philip and Samuel joined him in the militia he organized, and Frederick’s activities in the conflict gained him the title of captain-although probably an honorary one, since no service record for him has come to light. Frederick also served several political and ecclesiastical responsibilities around his home, and Samuel was Berks County coroner for a time. Benjamin, the youngest son, served in the American Revolution-as did most of the grandsons of Conrad Weiser. Through his daughter, Mrs. Henry Melchior Muhlenberg, Conrad Weiser made another contribution to Berks County of a family whose members have made their marks in civic life unto this day. Strangely, although Conrad Weiser owned an extensive estate in Berks County, all of it had been disposed of by his descendants by the l830’s, and few of his descendants remained in Berks County. Conrad also held rights to extensive lands along the Susquehanna River near Selinsgrove, and to these many of his heirs withdrew. It is possible, as we shall see, to trace the generation-by-generation migration of descendants of Conrad Weiser across the country from the farm near Womelsdorf to the Pacific coast. Such was the venturesome spirit Conrad’s heirs received from him that there are today more descendants of the great personality living outside of Pennsylvania than within its borders. And there are a very few still in Berks County itself. Let us take one family at random to illustrate the point. Conrad Weiser’s son Frederick stayed on the home estate to farm it until his death in 1773. His son Conrad continued in the location until the mid-1790’s, when he followed his father-in-law John Klinger into Northumberland County, where he died in the early 1800’s. He had a son, Frederick, who moved to Delaware County, Ohio, about 1814, as part of an extensive migration from Pennsylvania. Frederick’s son Peter was born in Pennsylvania and died in Ohio-like his ancestors before him, a farmer. Peter’s son, Charles Luther Weiser, migrated to Iowa. Charles’s son Arthur farmed in North and South Dakota until his death in 1955. He had several children, but one son, Russell S. Weiser, is on the faculty of the University of Washington in Seattle, where his only daughter was born. There are eight generations involved in the span between the original Conrad and the contemporary Russell Weiser-and not one of these persons died in the same community in which he was born. Thus Weiser’s descendants are scattered broadly throughout our nation. HomecomingYet, though his descendants are scattered widely throughout America, Conrad Weiser’s heritage stands strong and firm in his Heimat, Berks County. His farm has been made a state park. The surrounding school district bears the name of Conrad Weiser. In the not far distant mountains, which he often traversed on his embassies of peace, a Boy Scout camp honors his name. And we today, two hundred years after his passing, remembering him with gratitude, gather at Weiser’s farm in June, 1960, to commemorate his life, his rugged personality, his warm humanity. Nor can we forget his dedication to the theory that all men share something in common, out of which – by honest and honorable negotiation-could be shaped, first, the State of Pennsylvania, then the United States of America, and-someday- the United Nations of the World at Peace.